After facing quite turbid sea conditions over the past few days, the Salacia crew and I were excited to get underway in fair winds and calm seas. 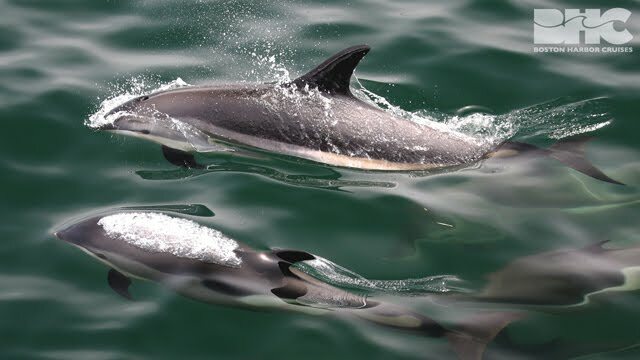 Our search took us to the far side of Stellwagen Bank, just north of the southeast corner, where we encountered a large pod of energetic Atlantic white-sided dolphins! 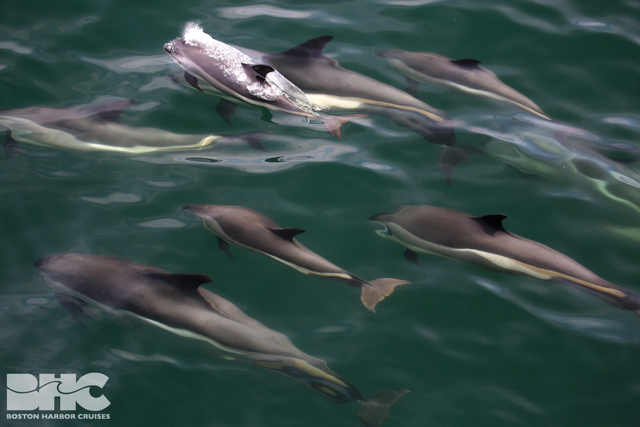 These dolphins, broken into smaller groups, were distributed across a large area where we encountered three additional marine mammal species! 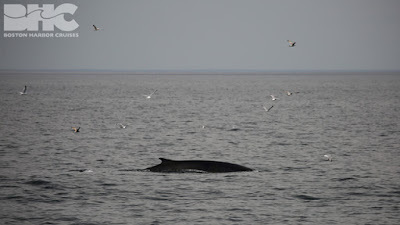 We first spotted a quick minke whale followed by two separate lunge feeding fin whales! 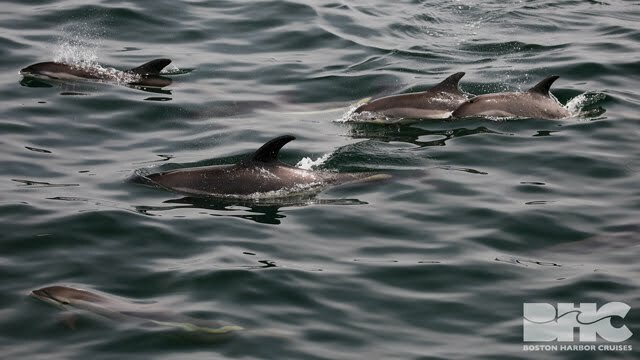 Last but not least, a humpback whale named Basin surfaced amongst these dolphins, only to dive back to the depths it came from. 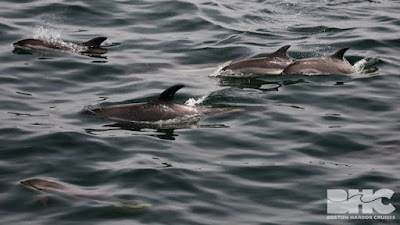 As we waited for Basin to return from its dive, we watched dolphins surface and feed all around the boat. 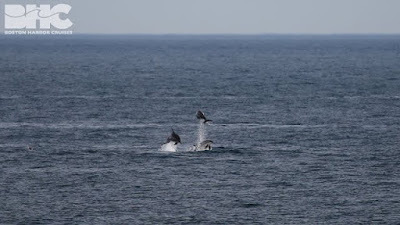 A few dolphins repeatedly breached in groups of three (see photo). 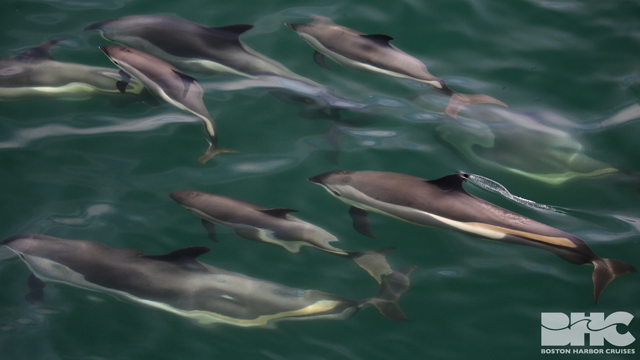 We also spotted a couple calves swimming alongside their mothers, as they weaved in and out of one another’s paths. The dolphin entertainment was welcomed between Basin’s long dives which we suspected were fishing pursuits. On one dive return, Basin surprised us with an open mouth lunge followed by a brief bout of kick feeding! On our last looks of Basin, this illusive feeder surfaced right next the boat giving guests beautiful views of its flukes before we made our way back to Boston! It was a beautiful and exciting day on the water! Today’s 12pm trip aboard the Asteria began heading toward our 10am’s trips sightings, however as we approached the SW corner of the bank, we spotted a solo traveling humpback (as well as a few minkes), who we identified as Pinch. The glassy seas gave us nice looks of this whale, and we could easily observe Pinch’s distinct flank – which has some interesting speckled white scars alongside its body (as well as a notch in front of its dorsal fin). I’m unsure of what these marking could be from, but as far we could tell, this whale appeared healthy and it’s skin-condition and/or skin-scarring doesn’t seem to effect it. After spending time with this humpback, we decided to head a little further east where the Salacia had been. 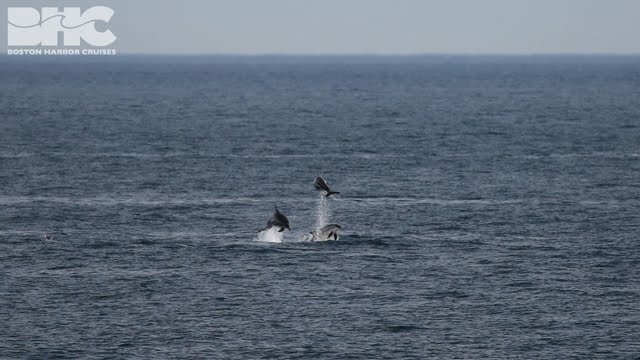 On our trek further east, we start to see some splashing for a distant lobtailing/tail breaching whale, as well as a smaller whale rolling around. We had heard reports from another whale watch about a humpback mom/calf pair, so we were hopeful to see who this pair might be. As we approached closer, we were completely surprised to find that this was a mother and calf North Atlantic right whale pair! New England Aquarium right whale research team. Though our encounter was brief (regulations require boats to stay 500 yards away, so we did not stay with this pair – please note that our photos are zoomed-in and cropped), it was happy moment to get to observe a new right whale calf. 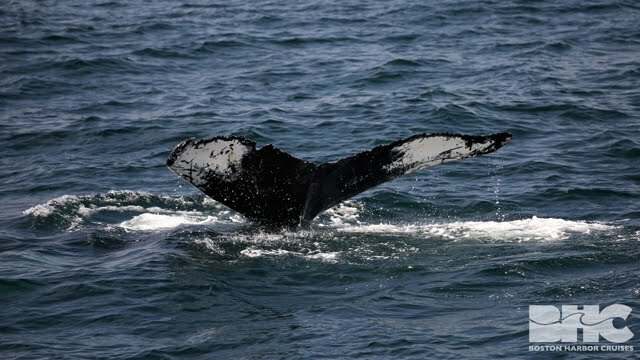 Recently a right whale calf was found dead off the coast of Cape Cod. Preliminary results of the animals autopsy (known as a necropsy) found several large propeller wounds suggesting a boat strike likely before death. Right whales face many threats, so I am hopeful this calf today has a brighter future in the years to come. If you observe closely on the photo of the mom and calf synchronized diving, you can actually see an entanglement scar on the calf’s tailstock, which is the other huge threat large whales face in the Gulf of Maine. 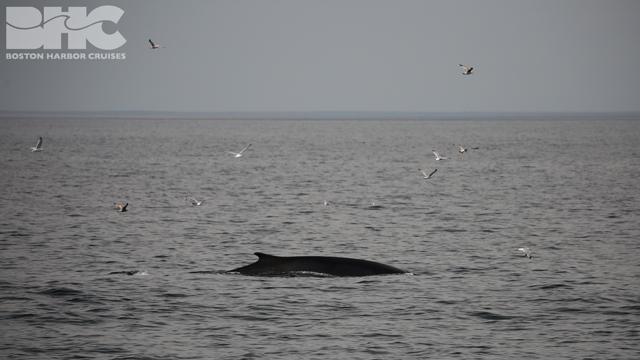 Our trip ended with a sighting of a fin whale, making it a four species marine mammal day! We also spotted common loons and northern gannets out on the bank.